Now, the tricky thing about Celtic mythology—as framed by Clarke, who is my sole reference point for this article—is that we cannot exactly know how truly the stories we know as “Celtic myths” line up to the ones originally told by the ancient Celtic people. Because as invaders and Christianity and war swept in, the stories that had once been legend for every Celts man and woman were edited or actively repressed by the new, angry people eager to impose their own belief systems and ways of life. And because the Celts relied so much on oral storytelling and memory, it was all too easy for their stories to pass away or change in fundamental ways during such a disastrous time. The “Celtic stories” Clarke digs up are what remain in manuscripts written by Christian monks, who patched together what they could remember, prefaced each tale with a declamation about how the pagan gods and goddesses in the stories weren’t to be believed, and likely changed aspects as they saw fit to do. That’s all a long way of saying that of the stories I’m reading, I’m never sure when the Celtic voice ends and the monk comes in. Or, really, when the Celtic voice ends and the monk, the Victorian folklorist, the 1970s anthropologist, and all the rest of the people throughout history who have retold and refitted the stories to fit their own conceptions come in. Anyway, I’m happily reading this book, my very first submersion in Celtic storytelling, and it’s all fighting and druids and new-born gods; good things, until I hit The Sorrows of Deirdre. It, too, begins normally: the king and his warriors are feasting and drinking in the home of a storyteller. But then it goes into new territory: the storyteller’s wife gives birth to a girl, and the druid Cathbad (who is a lot like Merlin) predicts she will be very beautiful and lead the nation to ruin. Of course, all the warriors want to kill the little girl, but the king has a weird feeling about this and decides instead to take the girl away from her parents and lock her up in a secluded place in the woods, to be raised as his companion by foster parents. And this is where I paused. Because this theme does not feel entirely new to me. I know stories where people want to kill kids as soon as they are born; and I know stories where girls are locked away in the woods; and I know stories where girls are too beautiful to live. Rapunzel, Sleeping Beauty, The Seven Ravens, Snow White, The Child with a Star on Its Forehead: these fairytales all play on these ideas. But there isn’t anything too new about that, after all; infanticide and isolation aren’t particularly unique ideas. I keep reading. The girl—Deirdre, of course—grows up in the woods, and it is a happy, lonely life, until fate happens and mistakes are made and she does, yes, lead the nation to ruin. And there are gods, and fighting, and Celtic-mythos-things. But it’s before all that where I want to focus. And this is where I almost throw my book across the room in shock, because that is spooky. Not the blood, not the raven! The combination: the blood was spilled on the snow, and the black was there to see. Murder can be understood as worldwide. Loneliness spans the entire globe. Beautiful women foil men everywhere and everyday. It is all natural that these things would show up in different stories, just as it makes sense for love and gods to. But to have both a German folktale and an Irish myth be based on the image of a woman staring at blood on snow near a black thing as she longs for a person embodying those colors? That is....odd. It is possible that this image could have sprung up in these two distinct places with no knowledge of its other; it is not unheard of for blood to spill on snow, though I’d argue the addition of the ebony/raven and the longing for someone looking that way brings things into weirder territory. But I think it is more captivating to believe these stories knew each other—and, somehow, turned into each other. 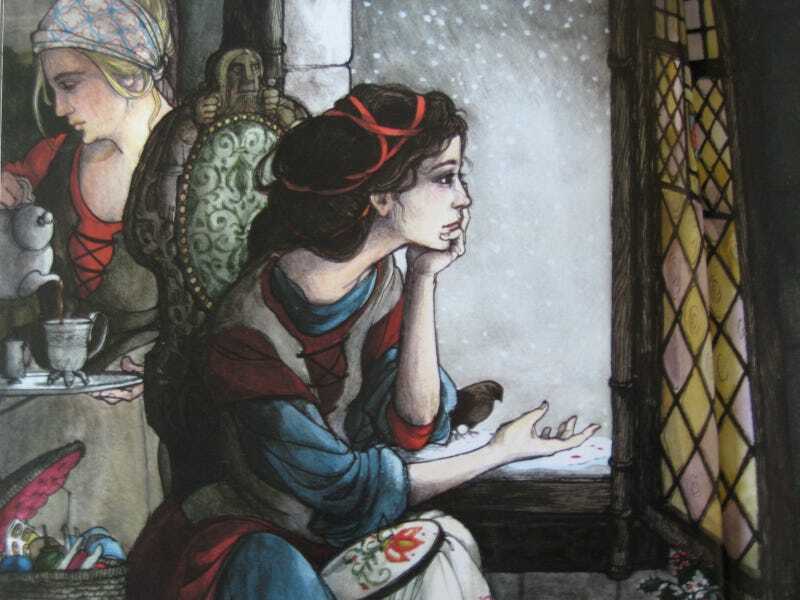 Which came first, Sorrowing Deirdre or Snow White? And who first thought of that image: red, on white, on black, and a lonely woman besides—and thought: here is a story! Have an opinion on Celtic myth or German stories or a cow as white as milk, the cape as red as blood, the hair as yellow as corn, the shoe as pure as gold? Tell us in the comments! *She does end up loving someone with skin as white as snow, hair as black as ravens, and a blush as red as blood. His name is Naoise, and they live happily ever after....until they are killed.